1. A idea for a bill is proposed by a Representative. 2. The bill is introduced to the House of Representatives. The bill is sent to a subcommittee for discussion, debate and a vote. If the subcommittee votes no, the bill dies. 3. If the bill is approved by the committee, it is sent to the entire House of Representatives for discussion, debate and a vote. If the House votes no, the bill dies. 4. If the bill is approved by the House of Representatives, it is sent to the Senate. 5. The Senate will send the bill to a Senate subcommittee for discussion, debate and a vote. The Senate may even amend or change the bill. This is very likely to happen. 6. If the subcommittee approves the bill, it goes to the entire Senate for discussion, debate and a vote. If the Senate votes no, the bill dies. 7. If the Senate amended the approved bill it will go to a committee made up of Senators and Representatives to create one bill. 8. Both houses will vote on the amended bill. If either house votes no, the bill dies. 9. If the bill is approved, it will be sent to the President. The President can sign the bill, making it a law or he can veto, or cancel the bill. If the President vetos the bill, it dies. 10. However, the House of Representatives and the Senate can override the veto and make the bill a law with a two-thirds vote. This is an example ofchecks and balances. 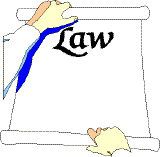 See if you can show the proper order of how a bill becomes a law by clicking here.